This June for our annual "Afterschool RoadTrip" we ventured to parts familiar to us, and beautiful interesting new territory. The landscapes and surrounding areas of each were relaxing as we would like, but still offered more activities to take part in that we could possibly do in our week away. 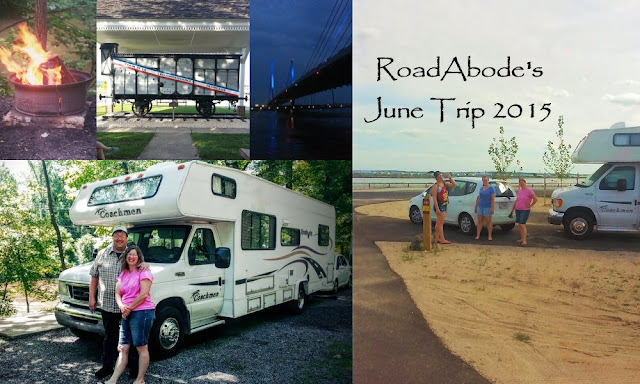 Since part of the fun of having a motorhome is travelling, we stayed part of our time in the woodlands of South-Central PA, then moved on to our first stay in the First state - Delaware. We need to store RoadAbode outside the city. This slightly limits what the girls can pack - which I believe is a good thing. We pack up our tiny Honda Fit coupe with the possessions needed for the week, and head to RoadAbode's home at the storage yard. Once there, we all pitch in to more the load. We also prep the Honda Fit with tow lights, as we use it as our "toad" - pulled behind RoadAbode with a tow bar. The Fit is the second car we've had a tow bar setup installed on, and makes as a perfect little car to explore wherever we are.. We pull RoadAbode out of her spot, pull the Honda Fit behind, and connect the car to the tow bar. Our eldest daugher has been helping connect up for years now, and knows the process. Amy does the drivetrain process - each car that is towable has a specific way to shift gears and get ready for towing. Finally we check each other and are on our way! It helps that we have four android phones with us. We have some favorite Apps we use. My smartphone is used as our GPS using Google Maps. (we still consult a printed map as well from time to time, or utilize campground directions) Amy's is used to scout out eateries, grocery stores or gas stations along our route. Hers is also used as our main phone if we want to contact the campground or anyone else during our drive. The other two switch off between listening to music, or consulting the Internet for interesting things to do at our destination or sights as we travel. And yes, sometimes the girls will ignore us up in the cab for a while and just use their smartphone to read or play a game, especially on longer trips. I forgot to mention Molly, our Lhasa Poo pup. She can be found either sitting on Moms lap, on the couch with one of the girls, or way in the back snoozing on our bed. She really enjoys the RVing life! On this trip our first destination was only two and a half hours away. We arrived at Jonestown KOA about an hour before check in, but they were gracious enough to check that our site was ready, and one of the young ladies escorted us to our site. There was a car parked not in our site, but close in front of it, making it difficult to pull in. The KOA staff right away checked with campers in the area, and quickly figured out it was a guest of someone staying at a Kabin close by. (They were having a birthday celebration for a child there) What some would have found aggravating turned out pretty nice, because it gave us a chance to meet the neighbors and find out how the weather's been, and where they were from. Our site was perfectly level, so we connected the essentials of water, electric and cable, then set out to get Barbeque! Within a 15 or 20 minute drive of the KOA sits a building that looks more like a feed store than a place to get good eats Shakedown Barbeque. is located on firehouse lane, which is a small winding farmers road off the beaten track in the middle of cornfields. Inside this establishment you find some of the best pork, brisket and chicken barbque you can have. Sit inside, outside, or take with - you will not be disappointed. Large portions of flavorful meat - with delicious sides. They also occasionally have live music to enjoy outside. After getting our fill of pork and brisket, we headed back to RoadAbode. 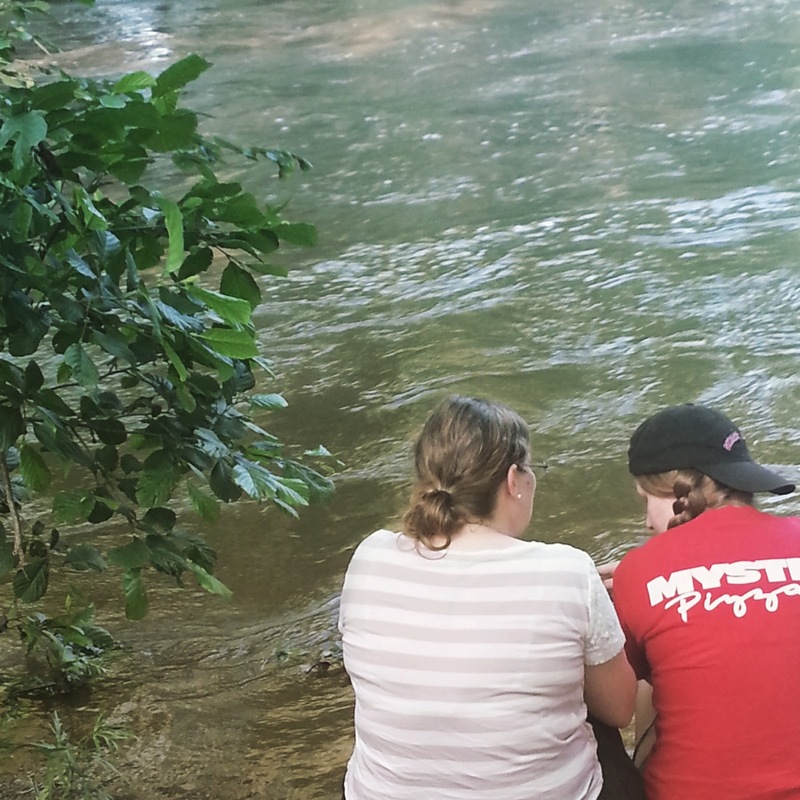 Normally we'd wade the creek looking for crawdads, fish or other creatures but because of recent storms, the waters of the Swatara were too deep and swift. Our plans for tubing or canoeing right from our site would have to happen another time. We sat a bit outside watch the waters, relaxing, reading and reconnecting. It's one of the joys of RVing together as a family.. As the day turned to twilight, we decided to play a game of monopoly. It's fun to be a little competitive, and maybe even chat a bit how just life - like monopoly - isn't always fair, but we can still help one another out. After an enjoyable competitive game, we watched a little cable, did a little reading, and headed off to bed. Dogs are probably more excited about camping than we realize. Monday - At the crack of dawn, Molly was waking me up to go out and explore. New sights and especially new smells were waiting for her to check out. And there are chipmunks and squirrels to chase after! I enjoy our walks as well. There are usually a few other early rising dog owners to say hello to, and sometimes we get surprised by seeing a doe or groundhog along the way. Additionally, since we are on vacation, I really dont want to waste too many moments laying in bed! Once Molly had sniffed and marked new territory, we headed back to RoadAbode for her breakfast, and my first coffee of the day. Remoting into work to check server processes was next on the agenda. Back at RoadAbode, lunch was a healthy salad since we were still pretty full from breakfast. In the afternoon, we took a short ride over to Fort Indiantown Gap. 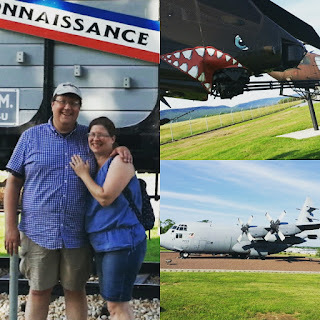 Though the National Guard Museum was already closed, we still enjoyed looking at the aircraft, tanks and memorials relating military history. Back at RoadAbode, our day progressed with lots of lounging, reading, or relaxing watching TV at our campsite till evening. A few games of cards were in order to close out the night. 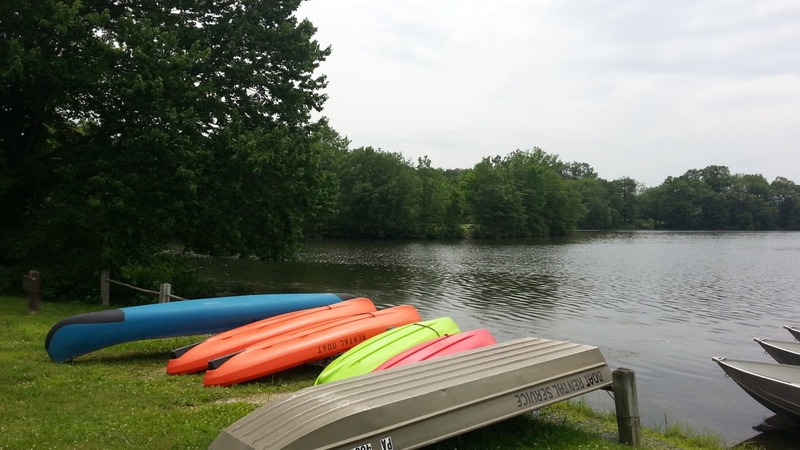 On Tuesday, since the creek was still relatively high and murky, we decided if we wanted to do any boating, Memorial Lake State Park in the middle of the Fort Indiantown Gap National Guard training area was our best bet. We took the the short ride over, only to find out that boat rentals are closed on Mondays and Tuesdays. We still enjoyed a short hike around the lake, but no boating this RVing trip out! We had some brats grilled over the fire for our evening meal, and enjoyed a game of clue for our the night's entertainment. After a relaxing few days at Jonestown KOA, it was time for a change of venue! Wednesday was our pack up and travel day. We've never stayed in the state of Delaware before, so we let Google map our drive down to our next stop - Delaware Seashore State Park. We stayed in the new North Inlet Campground Here is a Photosphere of our Campsite. You can drag the photo around with your cursor for a 360 view of our campsite. 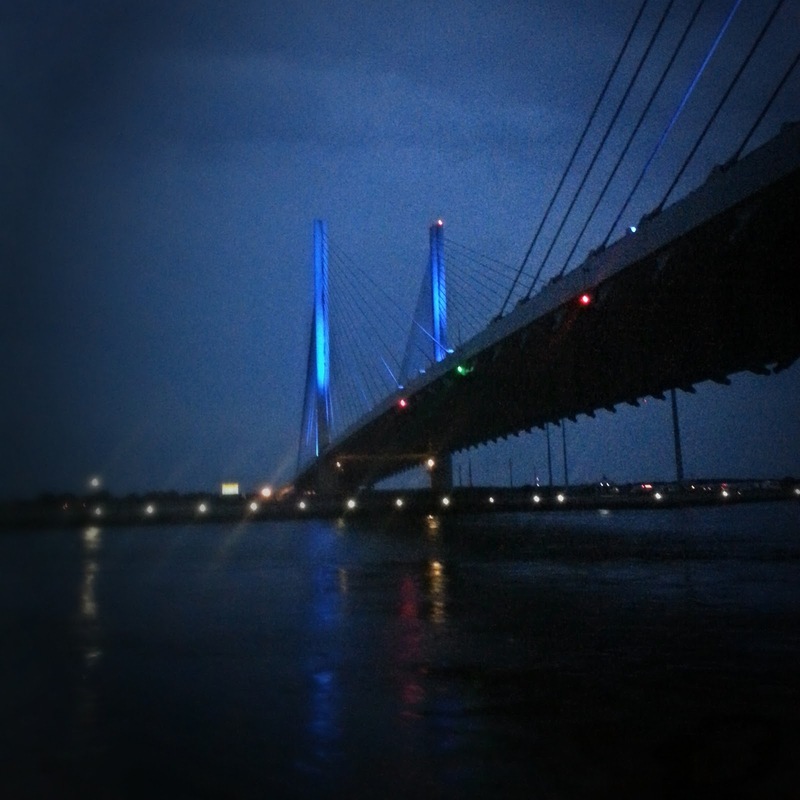 Most people call the bridge by the campground the Indian River Inlet Bridge. It's given name is the Charles Cullen Bridge, after a state highway commissioner of the 1930s . This beautiful cable bridge was built in 2012 and replaced a string of wooden and girder steel beam bridges. Check this link to learn the history of the bridges that spanned the inlet in this location over the years. While waiting for us to pickup Amy's order, the girls sat and people watched from a nearby bench. They also looked onto the dunes, and found a tiny bunny nibbling on the sandy. Never though of rabbits living on the beach! After the bunny sighting, we headed back to our Honda Fit, (meter almost out) and out of Rehoboth beach, back to our North Inlet Campsite. The sky as the sun was setting looked like it was on fire from our campsite, and the bridge light in blue gave this spot an almost patriotic feel. Great end to the day. The sun is up early here! Guess it should be, since we are right by the Atlantic Ocean. For a June trip, this probably was the most drastic environment change we've experienced. From stream and woodlands to a ocean beach spot with no mature trees at all in one day. Molly was ready to walk before 6am, and with the sun already up, so was I . This new campground is aligned between the bridge and the US Coast Guard station. There is also a public access parking lot directly next to the bridge. All the roadways are black macadam, and the walkways white cement. As we walked around the campground, there were only one or two campsites that those residing there felt needed leveling blocks or jacks. When we set up, we basically pulled in, checked the level, and then setup. Besides being well laid out, this campground also has very nice shower facilities, and even a great laundry room with large washers and dryers. Include that we have full electric, water and sewer hookups, and this is probably the nicest and well equipped state park we have enjoyed camping. Down past the campground if you continue walking the inlet road is the marina and Hammerheads Restaurant. Plenty for Molly to sniff on her morning walk! Today we stayed mostly close to camp. The girls headed to the beach, while I stayed back with Molly and enjoyed just watching the people and boats on the Inlet, and some light reading. 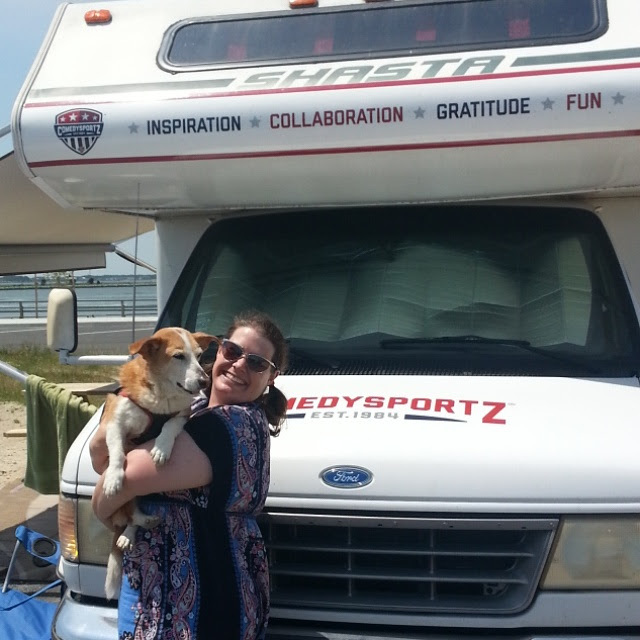 Claire and Sophie of "ComedySportz World Tour"
On one of Molly's walks we noticed a Class C motorhome with "Comedy Sportz World Tour" emblazoned on the side and back. A quick Google search and we found the story of Claire and her pup Sophie. So Amy and I wandered over, and interrupted Clair relaxing and reading a book outside her RV. Seems Claire had a great idea as an office dweller for Comedy Sportz - which is an improv group with locations in major cities through North America. She pitched a travel and marketing campaign - via a motorhome. She got the go ahead! You can follow Claire, Sophie and their travelling comic companions as they criss-cross the country to visit and work with other comedians. Check out ComedySportz here. Back at RoadAbode, though we all did snack as the day went on, we decided to head out for an early dinner. Using a Google Maps search for restaurants close to us, we found the highly rated Nalu in Dewey Beach. We piled in the car and headed over. Only a 10 minute drive from the campground, Nalu is a Hawaiian surfer themed bar and grille. 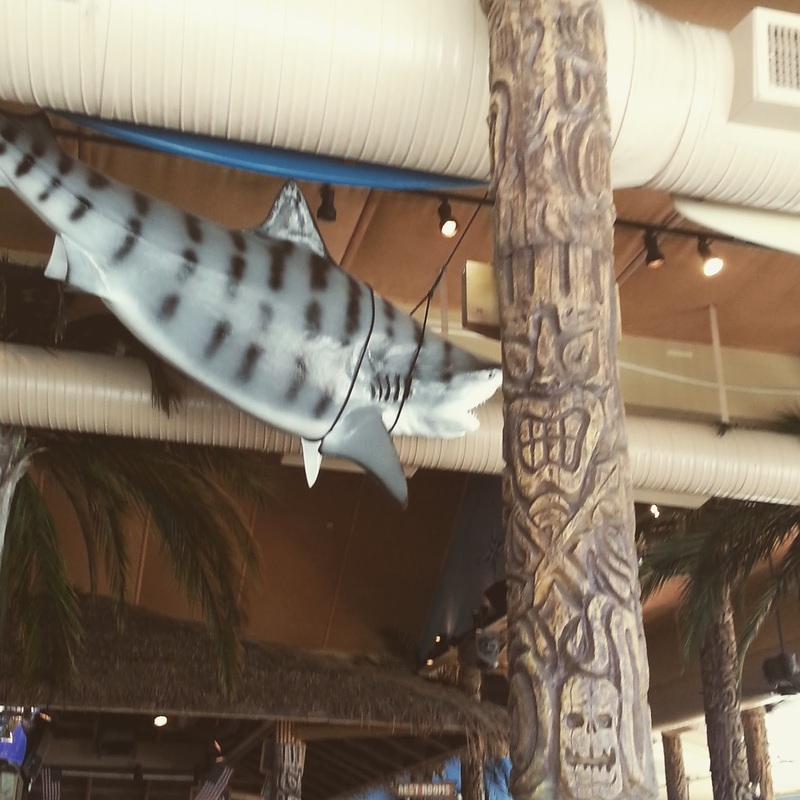 With open swing-out windows, palm trees, totem poles, tiki bar, and huge Tiger Shark hanging from the ceiling, we had the feeling we were sitting at an outdoor luau. The decor, may be over the top, but really put us in an island frame of mind. If you ever get the chance to head there, make sure to try the HUGH Nachos, and a plate of bacon wrapped pineapple. Plenty of tasty choices on the menu, many with a Hawaiian twist! After being thrilled with our dining find and filled with a tasty mix of seafood, pork and more, we headed back to camp. There were a few excited people pointing and taking pictures as we were about to enter RoadAbode. A pod of dolphins were swimming up into the bay! It was so cool to see dolphins - right from our picnic bench! Did not get good pictures, but you can see the dolphins a bit in this video. To end the day on a literal high note, the Park staff had scheduled a musician to play in the pavilion leading to the beach. 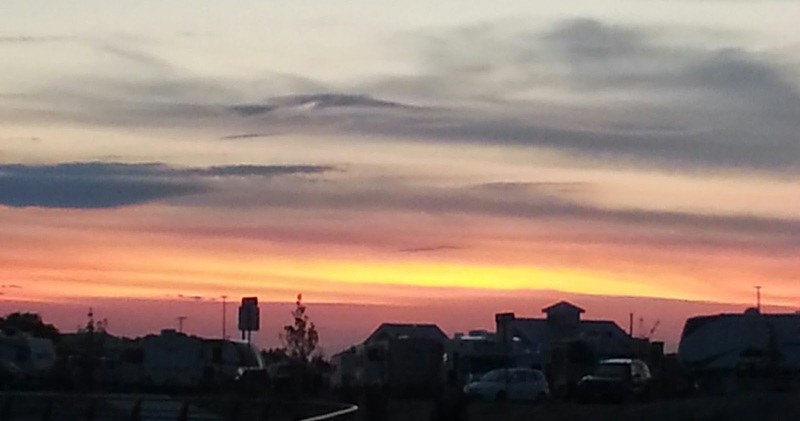 As the sun set, a mix of laid back beach and old rock ballads drifted through the campground. After the music, everyone was invited for a beach campfire featuring toasted marshmallows. Great way to bring a close to the evening! Since Friday was predicted to be wet, we planned a few inside activities in Rehoboth Beach. Traffic was crawling through Dewey and Rehoboth. Looked like day trippers and weekenders were clogging the roads. We stopped at the Fractured Prune for a breakfast of doughnuts. Their specialty is made to order hot donuts. Unique flavor creations abound, with combinations of sprinkles, toppings and glazes to make your own taste sensation. I went with a staff favorite - Maple glaze with cinnamon sugar named a French Toast doughnut. The girls went with a mint chocolate chip concoction, and a berry mix of some sort. We all enjoyed our sweet treats! Our main stop was to the Nassau Valley Vineyards. Beautiful grounds with well kept colonial buildings, the Winery was quite busy readying for an afternoon wedding and serving other tastings. We opted for a self guided tour, showcasing the history of wine-making more than the winery itself. Once we were able to get a tasting (requiring an additional wait after our tour) we tried a few wines on the sweet end of the spectrum. We did end up with a bottle of True Blue Blueberry and Peach Ambrosia - more for the novelty than because of the taste. The True Blue is produced from 100% locally grown blueberries. Still was fun to try some different vintages, and enjoy a short walk through the art gallery and grounds. The girls day seemed to be made more by meeting the vintner, who was a surprisingly young muscular surfer type that seemed to catch all the female eyes in the room. The young man being just a bit shy when introduced by the ladies who led our tastings seemed to make him even more interesting. We decided to stop for some "touristy shopping" as we headed back to RoadAbode. One place that caught the girl's eyes was The Sea Shell Shop. Connected to a mini golf course and ice cream parlor, the store seemed to have the trifecta of tourist traps rolled into one. Filled with all things nautically inspired, the girls found some trinkets to keep for themselves and for a few friends back home. I did well with my new motto "simplify." I don't need more clutter, though some of the items available were pretty. For our last full day enjoying the North Inlet at Delaware Seashore State Park, Amy baked a light breakfast of homemade buttery croissant rolls, which we devoured while watching the boats entering and leaving the Inlet. After cleaning up, we headed out to find out what the Mid Atlantic Sea Glass & Coastal Arts Festival was about. We learned that collecting sea glass, much like collecting gemstones, is become a "thing." People look for certain colors, shapes and love the jewelry and mosaics created with the glass. If the glass can be authenticated as from a certain age bottle, or from a period type of glass - it has more value. The items we saw were beautiful, even while walking among the booths in a slight drizzle. There were plenty of other artisans there with paintings, carvings and various interesting artwork - all ocean and beach themed. Add that they had some food and a live steel drum musician, and it was a downright good time., The girls picked up some seaglass to remember the trip, and a few other items. After, we walked and perused some of the stores on nearby 2nd street. The rest of our day we just enjoyed lounging at RoadAbode reading and enjoying our campsite by the sea. Sunday was our reluctant pack-up day, and we left at 11:55 am - right before our Noon checkout. We were not in a hurry to leave! I was surprised the traffic was not heavier on the way through Dewey and Rehoboth Beach. In face, we kept moving pretty well until we were at the Pennsylvania border. If this had been coming from the New Jersey Shore, we would have been in bumper to bumper traffic for over four hours all the way home! We made the trip back to storage in a little over 2 and half hours. We really enjoyed this year's trip, even though we were no more than 3 hours away from our home in Philadelphia. We had a nice mix of things we'd enjoyed before, and some new places to discover. We definitely recommend both Jonestown KOA and The North Inlet Campground at Delaware Seashore State Park. If you've been to these places, we'd love to hear what you enjoyed - or didn't - in these places. Hope to see you down the road! Happy Travels!